Anna Majoral – Master in Landscape Architecture Barcelona – Universitat Politècnica de Catalunya – 35ª EDITION. Architect by the School of Architecture of the Vallès (ETSAV), Master’s Degree in Urban Planning (2013) and Master’s Degree in Landscape Architecture (2009). 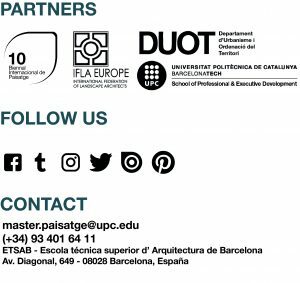 She is an associate professor in the Department of Urban Planning of the Barcelona School of Architecture and combines her teaching and research tasks with the professional practice developed by the Urban Planning Service of the Metropolitan Area of Barcelona. It is part of the Habitat, Tourism, Territory (HTT) Institute -an inter-university center formed by the Polytechnic University of Catalonia and the University of Malaga.